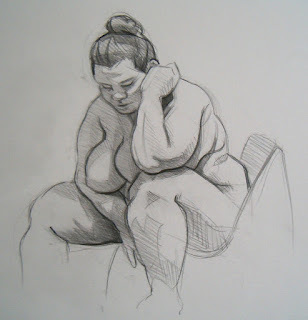 I made three separate starts at this figure study. The first failed attempt involved poor paper selection. The second try had page placement issues and fell to the eraser. It would be easy to call forty minutes of false starts wasted time. But any drawing or painting is ultimately the sum of the entire process that led to its creation. This drawing would not exist without the early miscues. Like almost everyone I started drawing as a young child. By second grade I was aware of an ability and have been at it ever since (see December 10th, 2013 post). Too many artists abandon drawing as they graduate to painting or other art forms. I have found keeping a drawing regimen and even focusing exclusively on the discipline periodically to be very helpful and rewarding. In order to produce solid figurative drawings it is important to work with confidence. Timid hesitant lines don't play well. Problems can arise when a confident working method leads to arrogance regarding ones broader artistic abilities. At various times in my life I have entertained the idea that I'm pretty good at this art thing. 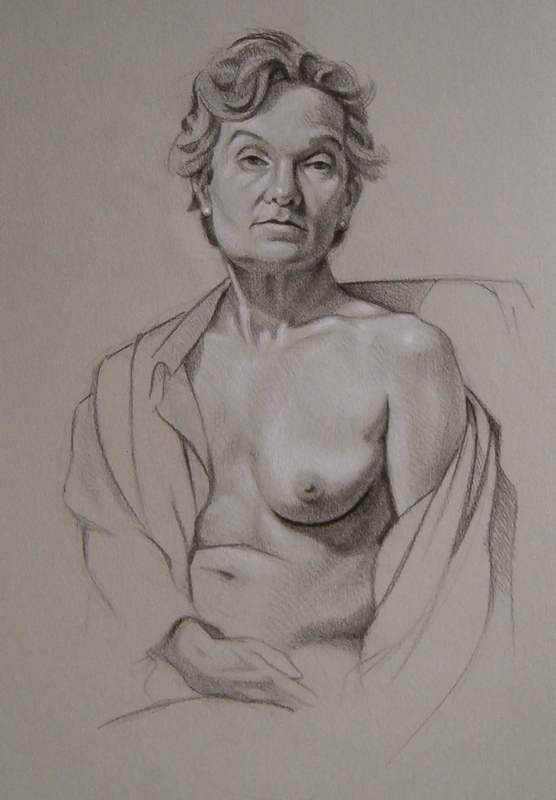 Drawing from the live figure has always let me know that there is ample room for improvement.